Babywearing has become one of the first ‘Right Decisions’ I made as a mother and I made this decision even before my baby was born. 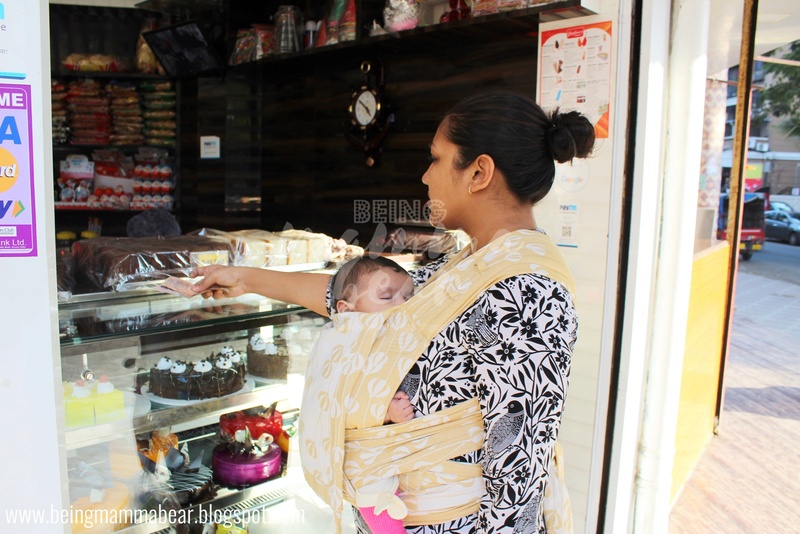 I started Being Mamma Bear back when I was still in my First Trimester and I stumbled on to the world of Babywearing very early on. I didn’t know its benefits but I wanted to do it looking at all those snuggly photos of babies cosied up with their parents. 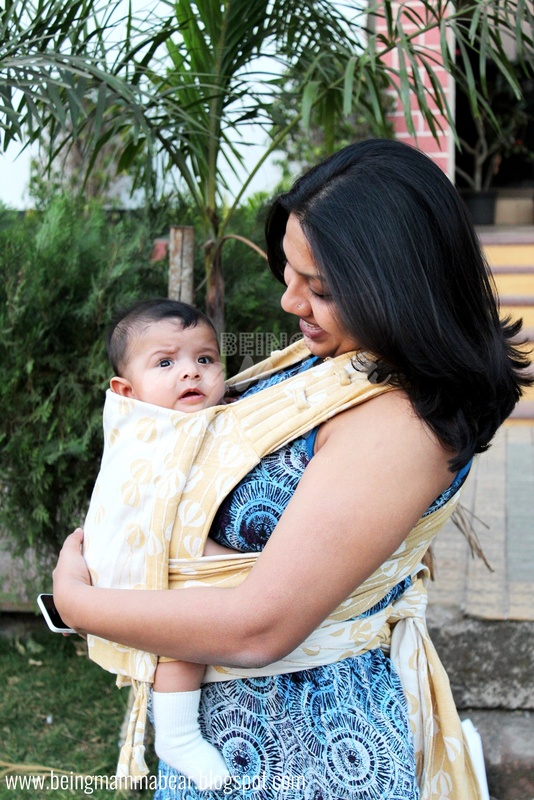 I wore my baby for the first time when she was barely two weeks old and I loved it. I don’t intend to stop anytime soon. In fact, I plan to wear her for as long as she lets me. So it was no surprise that when I was asked if I would like to try on one of Soul Slings‘ Meh Dai carriers for use and review, I’d say yes. I hadn’t tried a Meh Dai carrier yet, and so this allowed me do that as well. 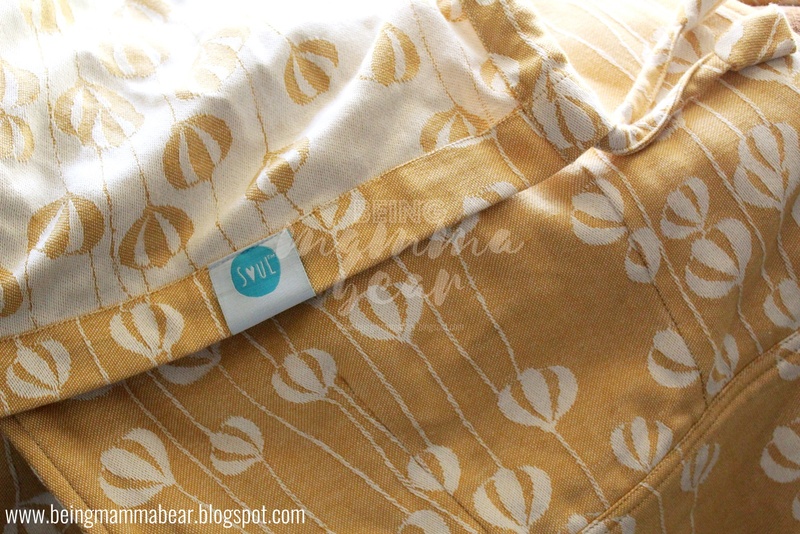 Since I was given a choice in the design, I picked the Flyaway – Jacquard Wrap Conversion Cotton Meh Dai because I loved the soft and subtle colours. I’m all about matching and pastels are my thing, so I felt this would go well with most of my clothes. I received the Meh Dai on December 12, 2016, and have used it on various occasions for almost two months before writing this review. Here’s a bit about my experience while using Soul’s Meh Dai. As with most of the new products I use, I always read the manual and any other instructions first. So I watched this video to understand how to wear the carrier even before it arrived. There are more ways to tie the carrier – like back carry and hip carry. Check out Soul’s YouTube Channel for instructions on how to do those carries. When I read the product description on Soul’s Website, it said that this carrier was meant for babies weighing at least 7 kgs. At the time, my baby was around 6.7 kgs and her head was almost stable but not fully. When I raised this concern to the Soul Team, they shared a video with me on how I could use this carrier for babies lighter than 7 kgs. So that helped me a lot. My baby just reached the 7 kg mark, so over the last two months, I’ve always folded the bottom panel inwards (as shown in the video) while using the Meh Dai. The manual said that the carrier was pre-washed and didn’t have to be washed. So I started using it as soon as it arrived because it was also mentioned that it would get softer with use. 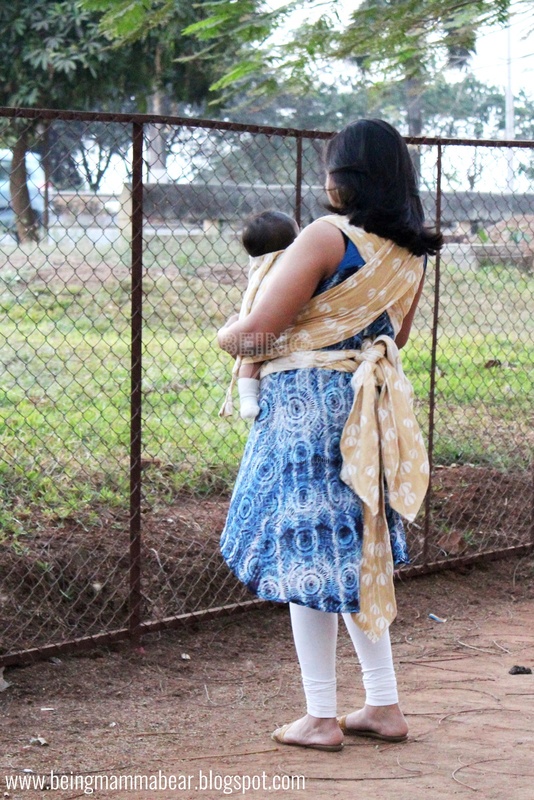 The first time I used the carrier, I was at home but I picked a very bad time to wear her – minutes before she got hungry. The second time I wore her, I was at a wedding reception. She was a little cranky at first, but then got comfortable a few minutes later and then slept off for most of the event. Since then, I’ve worn her in the Meh Dai when we go out for a walk. During these trips I have also bought stuff for the house and have been able to carry it in both my hands without having to worry about holding the baby. I’ve also worn her during trips to the mall. Soul has the Meh Dai in a variety of colours and prints, right from geometric prints, to Ikkat, to gorgeous designs with balloons as is the Flyway. There’s a vast range of colours as well from neutrals (blacks, whites and greys) to rich colours, so you have many options to pick from. 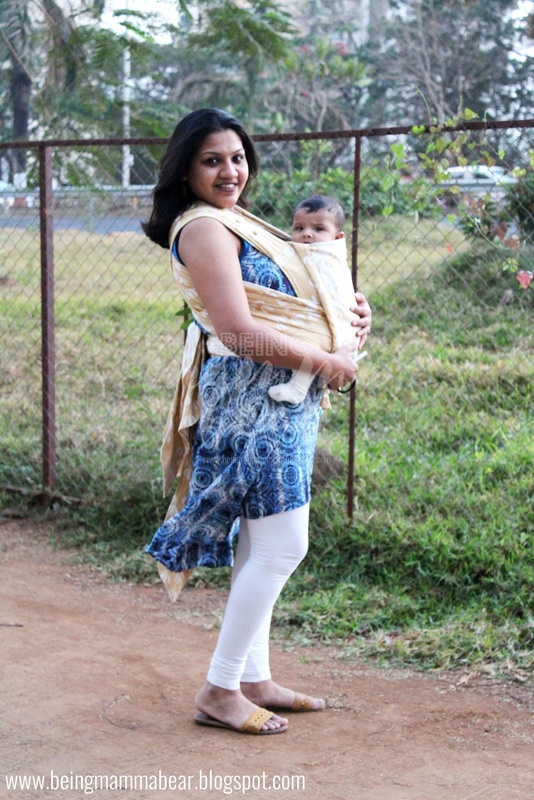 As the fabric is woven cotton, the carrier is very soft, airy and comfortable. It’s also extremely light so you hardly feel the weight of the baby (or the carrier, for that matter) when you wear it. This particular design costs INR 4,950. Soul has Meh Dai’s that are less expensive, least expensive being INR 3,500 and the most expensive one, INR 5,750. Since everyone operates on a different budget, I won’t comment on whether these prices are affordable or expensive. Based on the rest of the review, you can decide for yourself. 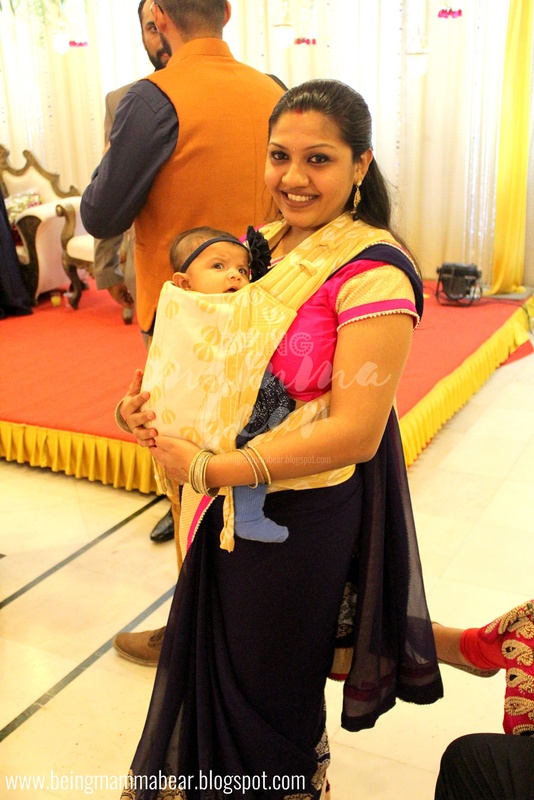 The recommended mininum weight is 7 kgs (i.e., almost 4 months old baby) and can be used till the baby weighs 18 kgs (usually around 3 years old.) It can also be modified to wear babies under 7kgs. If you intend to wear this with your newborn, please take the time out to search for and watch videos that show you how to do that safely with a Meh Dai. The Meh Dai is all fabric. 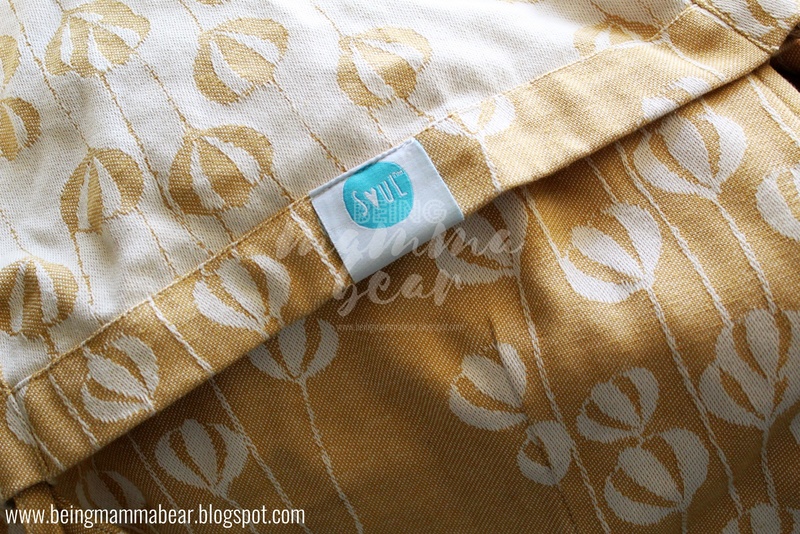 It has a main rectangular panel in the center and four fabric flaps to help you tie it around you and your baby. This allows you to wrap the carrier as tight or as loose as you want no matter what your body type is. As it is made of cotton, it is extremely soft and gets softer the more you use. 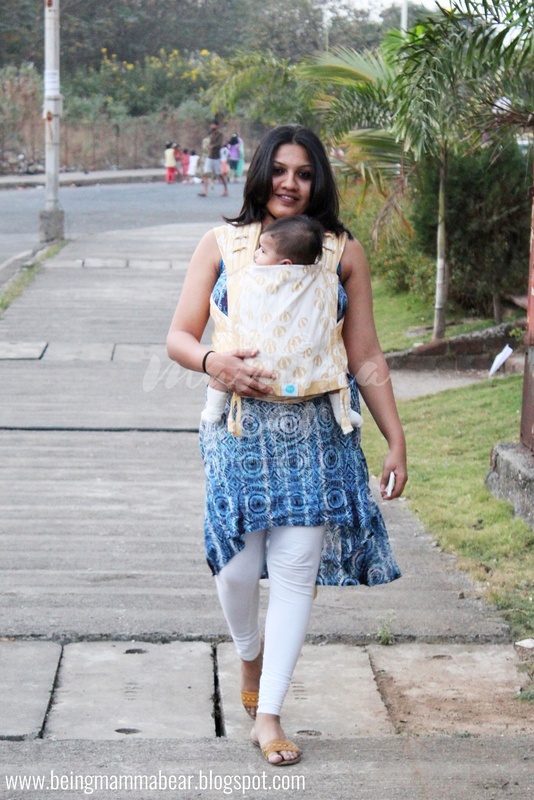 It has padded shoulders and the straps spread over your back to evenly distribute your baby’s weight over your back and shoulders making it very comfortable for you. 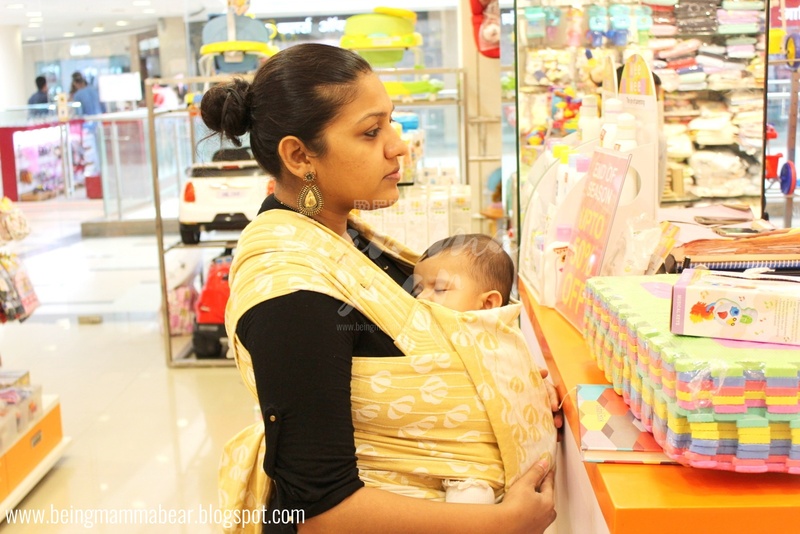 It is pretty easy to fold or roll this carrier and carry it around when you aren’t wearing your baby. It comes in a very cool lenin bag and I always stored it in the bag. If folded properly, it won’t take up too much space in your bag and it isn’t heavy either. Compared to a Soft Structured Carrier (SSC) or a Full Buckle, it is easier to wash as it is all fabric and has no buckles or straps that you have to be caareful about while washing. However, please read the washing instructions to understand the dos and don’ts while washing the Meh Dai. 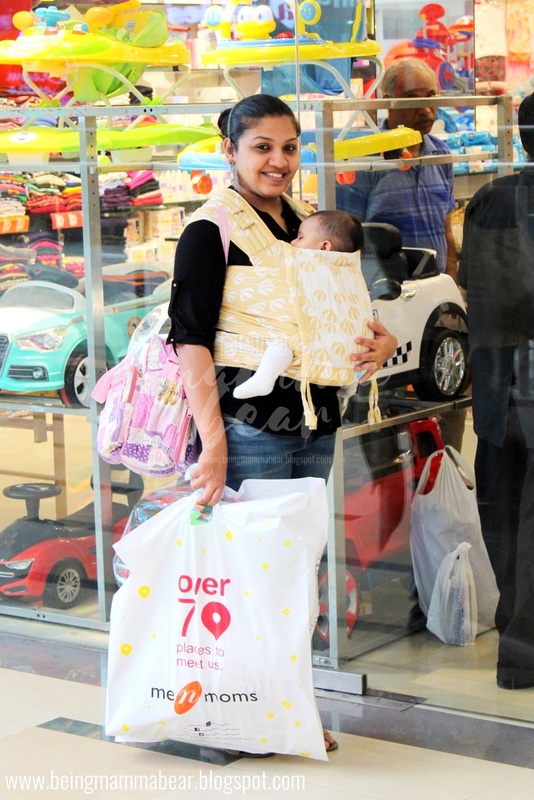 This carrier is perfect for wearing at home or for outings where your wouldn’t have to take it off and put it back on. Why? Read below. A Meh Dai is not as easy as an SSC/Full Buckle which is as simple as snap-wear-snap – that quick. Two tries and you’re an expert at wearing your baby in an SSC. The Meh Dai however, takes patience and practice. This is not, however, a reason to not try the carrier. Just remember that with this type of carrier you need to be patient and give it 3-4 tries (or maybe even more) to get it perfectly right. If you know you will have to take the carrier off and put it back on, make sure you’re in a place wrihere the flooring is clean, like in someone’s house. But if you’re in a public place where you know the floor is dirty, or you are outdoors, remeber that the flaps of the Meh Dai will touch the floor/ground as you wear your baby. Nothing wrong with doing that except you risk the tail end of the straps being stepped on, and you might have to wash the carrier more frequently. 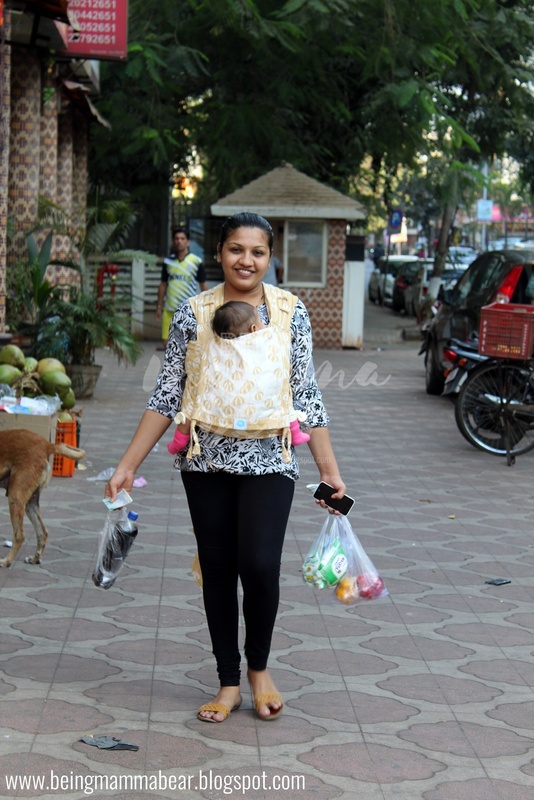 Whenever I wore my baby in the carrier, she was comfortable and so was I. I hope you find this review helpful and balanced. So other than the part where it takes time to wear the baby in the carrier, I wouldn’t hesitate before picking the Meh Dai. For as long as I used the carrier, I was really happy with it. 1. This is not a paid review. 2. The above mentioned points are purely my opinions and should not be considered as groundrules or guidelines for when you should and shouldn’t use the Meh Dai. Previous postBedtime Routine? Yes, Please! A very helpful review. I was waiting for your view it was insightful. Very balanced review, helpful to understand the product.